Navneet Gems is a supplier of Wholesale Rose Quartz, in a Very Pink Vivid Color. If you are looking for Wholesale Rose Quartz in Pink, than please contact us. Rose Quartz Gemstones can come in many shades, but Navneet Gems and Minerals stocks the highest quality of Wholesale Rose Quartz, which is referred to as the top quality of Rose Quartz. We have all shapes and sizes, along with all cuttings of Rose Quartz. Rose quartz is a natural stone, and comes under the Quartz category. Rose Quartz belongs to the Quartz family, which also includes Crystal Quartz, Smoky Quartz, Amethyst, and Citrine. Rose Quartz quality can be categorized by the naked eye. Rose Quartz ranges in color from light pink to a rose color with a red hue. The chemistry composition says that either iron or manganese are responsible for these colors. There are many retail sellers of Rose Quartz online, but when looking for a Wholesale Rose Quartz Supplier, there are only a few sellers, and one of them is us. 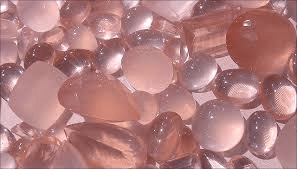 We stock many Freesized Rose Quartz gemstones, and in calibration also. 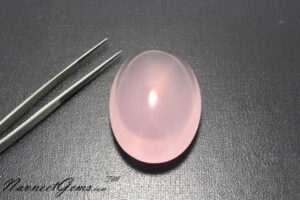 We keep Wholesale Rose Quartz Cabochons, as well as cut gemstones with amazing facets, in stock. 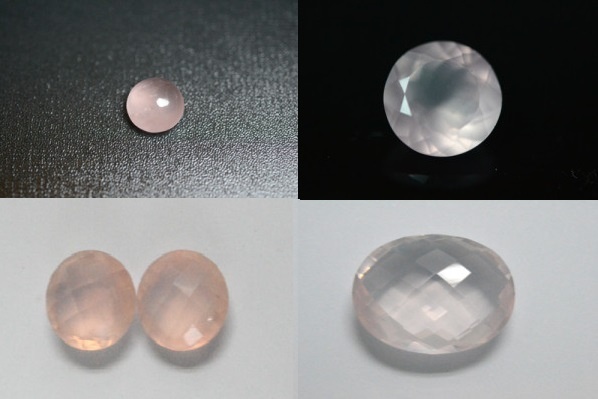 These are photos of only our Rose Quartz cabochons. We have continuous orders for excellent quality of our faceted Rose Quartz as well. We stock these, for the most common sizes, others we do on an on order basis. Please get in touch with us asap to source Wholesale Rose Quartz from us.